Over the last few years we’ve all felt that the risks to our employees when travelling on business has increased. In 2019 a new report has revealed that 47% of organisations believe travel risks are on the rise . 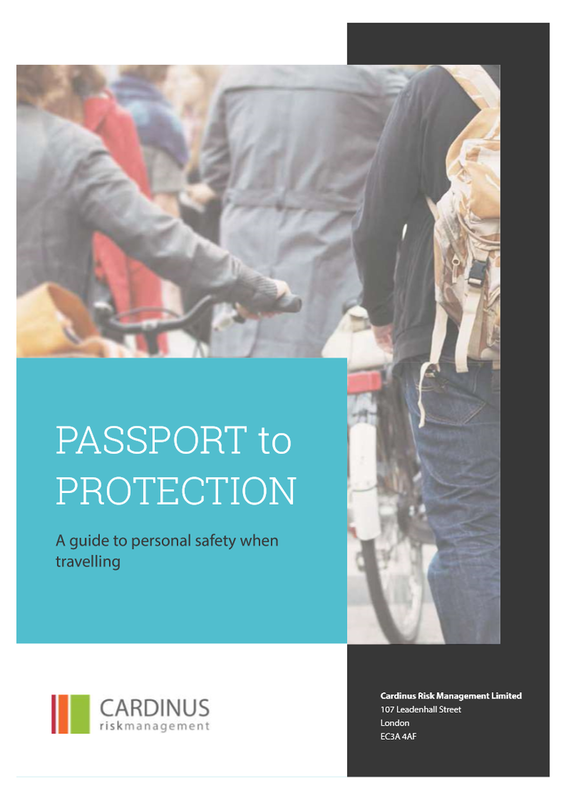 Passport to Protection, the new travel safety handbook for business travellers from Cardinus Risk Management, hopes to add another easy way to provide expert safety guidance to travellers to keep them safe. The travel-size book, which features interactive QR codes and a perforated casualty care card and ‘Useful Contacts’ sheet, provides easy-to-read, professional guidance for just about any travel situation. It’s simple to follow and laid out in a practical and useful way, making it a valuable handbook for travel safety. Not only does it make an ideal guide for travelling business employees, it’s a fun and enjoyable read, ensuring that your employees want to get stuck in and are engaged with the practical advice imparted in the book. Want some advice staying safe when walking around a foreign city? Perhaps you need advice for working in a potential dangerous part of the world? Or maybe you just want to make sure you don’t alarm your hosts with a misplaced handshake? You’ll find it all in here in this simple to follow handbook. Of the book, Andy Neal said, “I wrote this travel safety guide after years of travelling to hostile and not-so-hostile environments and seeing fellow business travellers make mistake after mistake that left them exposed to the risks of a theft, kidnap and other dangers. The handbook has been launched by Cardinus Risk Management and is available via our website- https://www.cardinus.com/travel-safety-handbook/ - or directly from Cardinus Risk Management. For businesses who would like to discuss white labelling the handbook, it can be requested online. For more information on Passport to Protection, or to hear more about Cardinus’ expertise in organisational and travel safety, speak to Cardinus on 020 7469 0200 or email info@cardinus.com.